Entries concerning the topic of immigration and naturalization. American Immigration and Citizenship ConferenceThe American Immigration and Citizenship Conference (AICC) and its predecessors, the National Council on Naturalization and Citizenship (NCNC) and the American Immigration Conference (AIC), shared information with and coordinated the activities of organizations and agencies concerned with a more humane, nondiscriminatory immigration and naturalization policy. The National Council on Naturalization and Citizenship was formed in 1930 as an association of organizations and individuals who sought to reform naturalization laws and regulations. The Council advocated policies and procedures that were humane, uniform, and simple. Among its prominent leaders were Ruth Z. Murphy, Read Lewis, Abram Orlow, and Frank Orlow. AmericanizationUntil the start of the 20th century, Americans typically believed in the power of the “melting pot” to create a common culture out of the various groups coming to America. However, this surge in immigration led to the creation of Americanization programs. Citizenship Survey (1914)"A Citizenship Survey in Chicago," by Philip L. Seman for the Chicago Hebrew Institute (1914). "In accordance with the original suggestion made two years ago at the Baltimore conference, the Chicago Hebrew Institute began a house-to-house survey, the object being to ascertain the citizenship status of the residents as well as their literacy, particularly with reference to English." Deportation of the Insane Aliens: 1907The present course taken by the United States Government in deporting insane aliens who have been in this country for some time is characterized by unnecessary harshness and even injustice. The purpose of deportation is to save this country the expense of maintaining a dependent person. The great majority of the aliens who are deported are persons who entered the country in perfectly good faith, with the intention and desire of earning a living, and in the vigor of youth, the average age of those deported being thirty years. It is not altogether their own fault that such aliens find themselves surrounded by economic and social conditions so unfavorable to their mental and physical health that they break down under the strain of competing with those who are better adapted to the conditions of life in this country. From Bohemia: Ma and Pa Karas (1940)Two years ago Louis Adamic, author of "My America" and editor of Common Ground, undertook one of the most ambitious writing projects of our time—an analysis of America's great melting-pot experiment, based upon 9,500 questionnaires, 20,000 letters of inquiry, 38,000 miles of travel, with the assistance of the Rockefeller and Carnegie foundations. This chapter, abridged from the resultant book, "From Many Lands" (to be brought out by Harper & Brothers) affords a wholesome sidelight upon the traditional American resolution of some of Europe's individual minority problems of a generation ago. Immigration: A Report in 1875Mr. 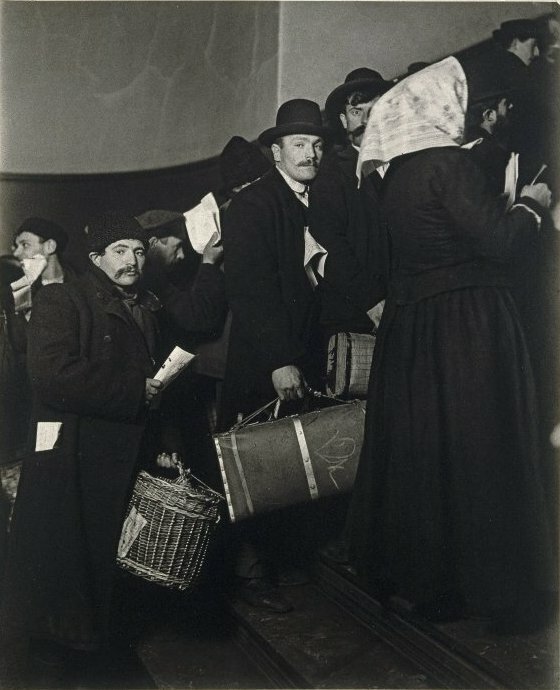 Kapp has tersely stated the rule which governs the movement of emigration to the United States: " Bad times in Europe regularly increase and bad times in America invariably diminish immigration." In the present instance, certainly, there can be no doubt that "' bad times in America " have led to the diminished numbers. However serious the great failures of the autumn of 1873, and the general depression of trade throughout the country subsequently, have been felt to be by those at home, they have seemed much. National Council on Naturalization and CitizenshipThe National Council on Naturalization and Citizenship was formed in 1930 as an association of organizations and individuals who sought to reform naturalization laws and regulations. The Council advocated policies and procedures that were humane, uniform, and simple. Among its prominent leaders were Ruth Z. Murphy, Read Lewis, Abram Orlow, and Frank Orlow. Naturalization Process in U.S.: Early HistoryWritten by Eilleen Bolger. The first naturalization act, passed by Congress on March 26, 1790, provided that any free, white, adult alien, male or female, who had resided within the limits and jurisdiction of the United States for a period of 2 years was eligible for citizenship. Organization of Municipal Charities and Corrections (1916)Paper presented by L. A. Halbert, General Superintendent, Board of Public Welfare of Kansas City, Missouri at the National Conference Of Charities And Correction Held In Indianapolis, 1916. "If we were able to ascertain the activities of all incorporated towns and cities, it would show a tremendous volume of activity and an expenditure of many millions of dollars." Refugees Here (1940)How are we going to help the refugees find a place in the life of the nation? How must such help be constructed, to interfere as little as possible with the economic situation and to help the American people benefit from the arrival of the refugee? These questions do not only concern the organizations which were formed to deal with the refugee problem. They are of great concern for the general public. Without its cooperation a policy concerning the refugee can neither be constructed, nor can it work. Without an adequate understanding on the part of the public, the efforts of these organizations will be greatly hampered. Schools for New Citizens (1941)Article written by Viola Paradise appearing in Survey Graphic, 1941. "September . . . a new school term. Not only for America's millions of school children, but for some two and a half million adults, as well. Under the sponsorship of local school boards, WPA, settlements, unions, churches, they study subjects ranging from simple English to international relations, from Diesel-engine operators to dietetics." True Americanism - Address of Louis D. Brandeis (1915)Speech given by Louis Brandeis on the subject of Americanization and the essential ideals of America.